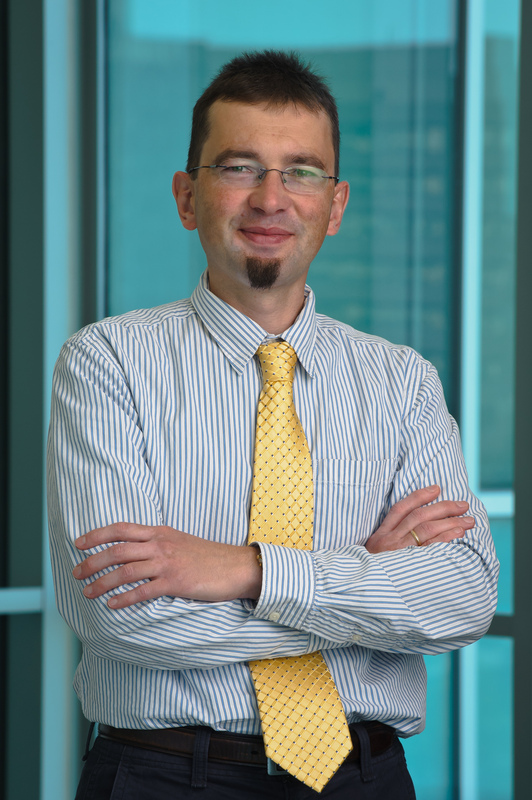 Sergey Cheshkov received his Bachelor’s Degree in physics in Bulgaria and his PhD in physics at the University of Texas at Austin. 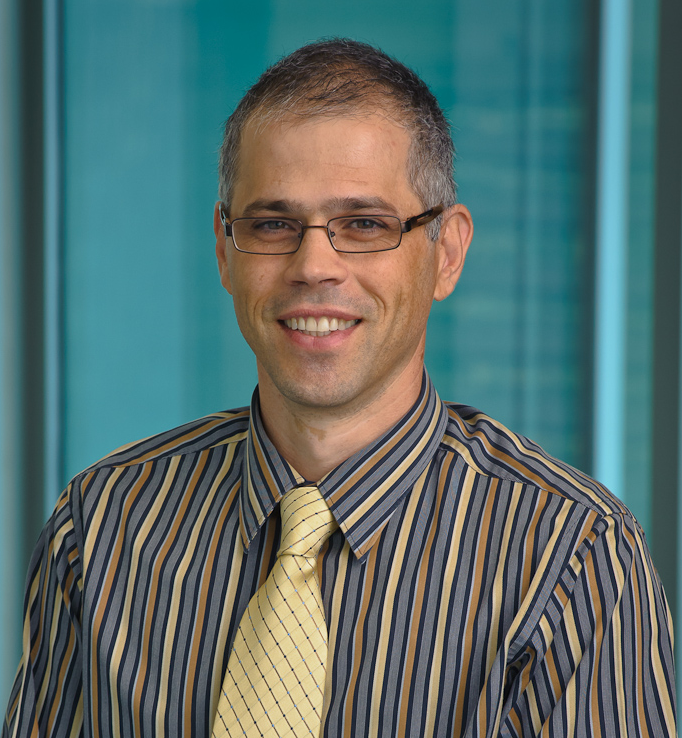 He is currently an assistant professor in the Advanced Imaging Research Center at the University of Texas Southwestern Medical Center. Craig Malloy is a clinical cardiologist and the medical director of the Advanced Imaging Research Center at the University of Texas Southwestern Medical Center. In their paper, they used Carbon-13 NMR spectroscopy to investigate non-invasive biomarkers for brain energy metabolism and neurotransmitter production. As you can imagine, we had many questions for them. MRMH: Can you give a brief summary of your paper? Sergey: In this paper, we wanted to propose a noninvasive method to study brain metabolism and glucose oxidation in the living human brain, by utilizing Carbon-13 NMR spectroscopy. Current tools used to study brain metabolism have real limitations. For instance, positron emission tomography (PET) scans are more or less the standard for glucose metabolism, but have limitations such as ionizing radiation which make them unsuitable for many types of exams. More importantly, PET can’t follow the fate of glucose through glycolysis or oxidation in the TCA cycle. There is lots of important previous work infusing carbon-13 labeled molecules into humans with detection by NMR, but these kinetic studies require long infusion periods in the magnet, which is not easily practical for real patients. We wanted to investigate the information that we can get from a relatively simple, steady-state exam. We have a terrific 7 T magnet here, and we know very well that high field will give us better sensitivity and better spectral dispersion, so we decided to use that for this project. Craig: We have a great deal of textbook knowledge about what we think is going on in brain metabolism, almost all of it based on animal research. How this information fits together in a real human being is highly controversial, and it is even more challenging to study brain metabolism in patients. As Sergey mentioned, the problem with a radioactive tracer is that the physics prevents detection of individual metabolic pathways. The key advantage of Carbon-13 NMR spectroscopy is to investigate the individual metabolic pathways in a person. For example, your brain has to continuously replenish the neurotransmitters (i.e., glutamate, GABA), but what is the rate of this synthesis? It’s controversial. Yet, this is a very basic physiological feature of the brain that is difficult to investigate by current technology. MRMH: You use anaplerosis in your paper as a proxy for metabolic function. What is anaplerosis? Why is it so important to quantify it? Sergey: When we are talking about the TCA cycle, anaplerosis is the replenishment of intermediate molecules (i.e., malate, citrate, etc.) within the pathway. For instance, in a normal functioning brain, neurotransmitters are released into the synaptic cleft, then mostly recovered afterwards. But the process is not perfect, which means that some of the neurotransmitters are lost. Because of that, the brain must continuously replenish these to function optimally. The replenishment process could be different in pathology. We know from other studies, including Craig’s previous work on glioblastoma, that in tumors anaplerosis is ramped up tremendously. That brings us back to the point of markers, which can be extracted from this method. Craig: The word anaplerosis refers to the capacity of tissues to replenish molecules needed for function or growth. The brain has to restore the neurotransmitters to maintain their concentration via various pathways, which are difficult to dissect in humans. We think that anaplerosis has something to do with brain pathology and clinical disorders. Thus, the advantage of our work is to provide a reasonably simple way to measure it, relative to turnover of the TCA cycle. It’s not flux information, but it is a biomarker of anaplerosis. MRMH: Which clinical applications do you think would benefit the most from your work? Sergey: After we did this study in normal subjects and we looked at the carbon spectra, it is interesting that we didn’t see lactate in healthy subjects. There is a lot of literature about traumatic brain injury (TBI), and a lot of arguments about the role of lactate in those injuries. Is this a harmful by-product? Is it fuel for neurons as long as neurons are still functioning and becomes harmful when they are not? So my first thinking about clinical application is mild TBI. For now the approach is not localized, so I think the cases that could benefit the most are those that do not inherently require high spatial resolution. MRMH: To address the poor sensitivity to 13C, you use the high static field of 7 T. You also mentioned another option to increase SNR would be to combine 1H decoupling with nuclear Overhauser enhancement (NOE). Could you comment on that? Sergey: In this particular study, we were looking at the carbonyl region of the spectrum so our carbons of interest were non-protonated. If you were to also apply the 1H decoupling, you would still benefit, but to a much lesser degree than normally observed for carbon spectroscopy with directly-bonded protons. However, you would be able to remove those longer range couplings and increase a little bit of the signal to noise. Recent work by Jun Shen’s group at the NIH implemented a low power NOE and decoupling and observed increases in SNR. We started doing similar experiments in our center with up to 50% increase in SNR in phantoms, which is very promising. Craig: The reason why we picked on the carbonyls (non-protonated carbons) is because they are convenient to measure in the absence of NOE, but unfortunately we are throwing away an enormous amount of information from all the aliphatic (protonated) carbons. If we can do proton decoupling safely in a human at 7 tesla, the information content will be vastly greater. 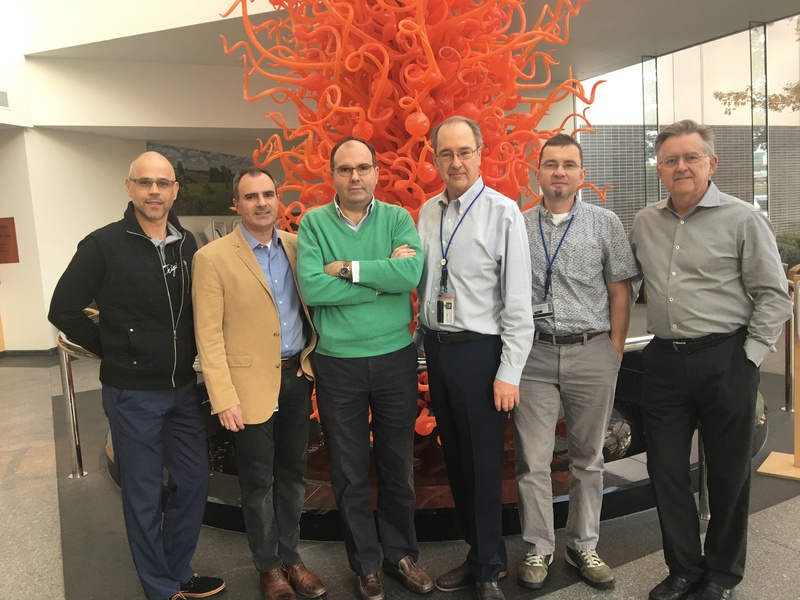 For this, we need the help of physicists to make sure that we have safe, convenient, broadband proton decoupling at 7 T.
From left to right: Ivan Dimitrov, Ralph DeBerardinis, Juan Pascual, Craig Malloy, Sergey Cheshkov and Dean Sherry at UT Southwestern. MRMH: Moving forward, where would you like to take this work next? Sergey: The biggest limitation of this work is the spatial resolution issue. 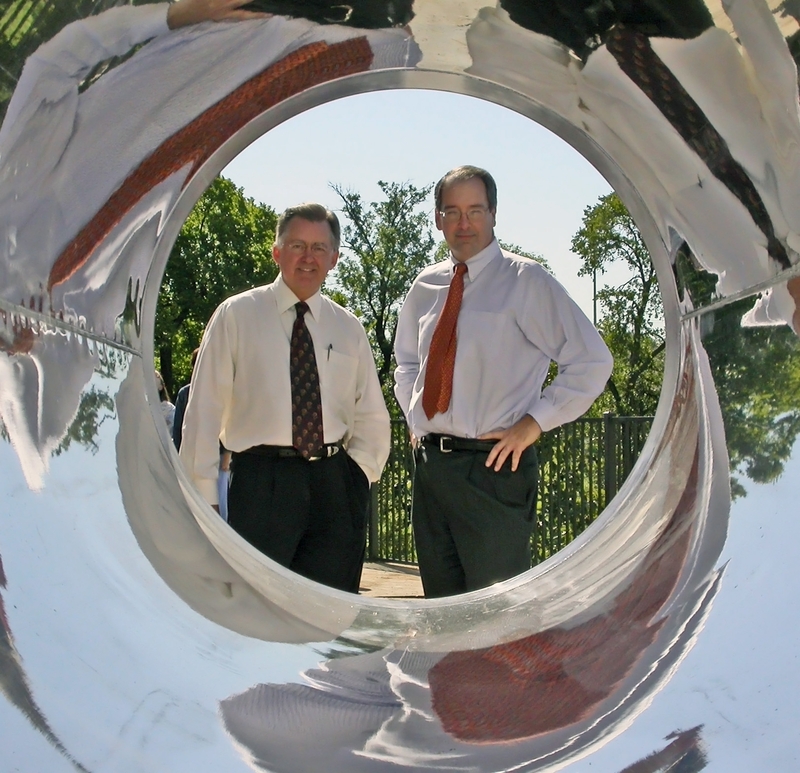 We have several related projects going on currently aimed to develop carbon phased arrays and multinuclear, multi-channel infrastructure, which could give us an additional gain in SNR. Then, we will test that our method is clinically applicable. Craig: Even if I am interested in detection of glutamate, glutamine, bicarbonate, absence of lactate, etc., it is impossible to imagine clinical applications with zero spatial resolution. If we want to translate this to a real clinical impact, we need better spatial resolution. The coils that we are using are sub-optimal, so this is our highest priority.